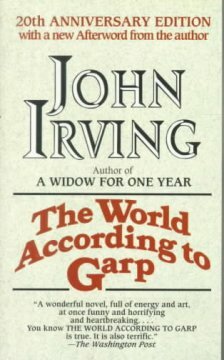 The World According to Garp is the third book I’ve read by John Irving and I think I’m ready to be done. Mr. Irving sure does love writing novels about men who like older women. He sure does like starting those novels well before the actual story starts, which leaves you reading 200 pages of boring drivel before you get to the good stuff. He sure does like writing about men growing up with single mothers. This all might be forgivable except that Irving is very much a plot-driven author. His writing is solid and all but it’s the characters that get you through his bloated works. And when you’re reading basically the same story for the third time, well, those characters aren’t quite so compelling anymore. This entry was posted in book reviews, fiction and tagged book review, fiction, irving. Bookmark the permalink.